Yes, you read it – think of Black Friday as MORE than just shopping for holiday gifts. Consider these strategic holiday entertaining and shopping tips from experts Dawn Sandomeno and Elizabeth Mascali, authors of Plan To Party and the founders of The Party Bluprints Blog. They have been featured on TV, radio, and in national publications like the Today Show, Martha Stewart Radio, Good Housekeeping and many more. Dawn and Elizabeth created Best Holiday Gift Ideas for 2011 at Party Bluprints Blog and have teamed up with CheapSally.com to find the lowest prices on their favorite gifts. First off, Dawn and Elizabeth recommend shopping for gifts and products for your holiday parties on Black Friday in order to save time and money. Many deals sell out quickly so you need to locate and act on the information fast. You will save time and money by visiting CheapSally.com's Black Friday and Cyber Monday pages because they aggregate all the best deals across the internet for you, offering a one-stop resource for saving. But before you shop, read these Holiday Entertaining tips from Dawn and Elizabeth. Their approach to gifting and party planning is simple: keep it easy but elegant, and save money and time where you can. 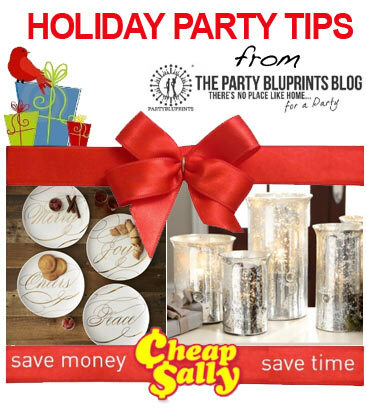 Here are 7 super tips that not only save you time, but allow you to enjoy your own party! Remember these tips and product recommendations when you shop for Black Friday deals this Holiday season and get the cheapest prices for them at Cheap Sally. Set your bar area the day before your party. Make it easy by letting your guests make their own hot drinks by using a single serve coffee maker, like Keurig, in the bar area. Keep an eye for single serve beverage machines on Black Friday deals to get one. Make ahead meals like casseroles are great for holiday entertaining and can be served in one dish. Save money by creating more decadent looking dessert cupcakes with a nonstick mini cupcake maker instead of a fancy dessert. There is nothing wrong about not hosting a dinner party, but focus on desserts only. Cocktail and Dessert parties are this years trendy way to entertain for those with limited time and money. Buy simple white plates that match with any decorating theme, they come cheaper in the long run than paper plates and are much more elegant. Black Friday and Cyber Monday are great days to find a deal on entertaining must have products like dishes. Speaking of dishes.. Clear dishes, rinse and load in dishwasher after each course of a holiday meal. Work as you go so they don’t pile up. When everyone leaves you won’t be left with a big mess to clean up. Graciously accept guests’ offer to help with the dishes, this makes many people feel good. Don’t forget the entertainment for the kids during your Holiday parties. Consider setting up a Wii party with the new Just Dance 3 game and check out other latest games on sale on your Black Friday shopping spree to keep the kids of all ages happy during this Holiday season. This is a sponsored post written by my dear friend Katja Presnal, an Addy Award-winning social media strategist who owns the Skimbaco® blog network and lifestyle brand. She inspires to live life to the fullest and does it by combining social media with everything else she loves. You can connect with her on Twitter@katjapresnal and read more at her blog Skimbaco Lifestyle.